A Thanksgiving meal in south Louisiana is not complete with out traditional Louisiana dirty rice. Made with your preference of meat or seafood, traditional dirty rice is a great accompaniment to a turkey dinner. I prefer my dirty rice made with turkey (dark meat) and rich stock. How do you like your dirty rice? I hope all of you enjoy your thanksgiving day, meal and family! No matter what you serve or where you are, remember to count your blessings. I am counting mine...thankful for each and every one...including you! The Soft Clamp Wire Wreath Form enables you to create a custom wreath in as little as 10 minutes with under $12 worth of supplies. 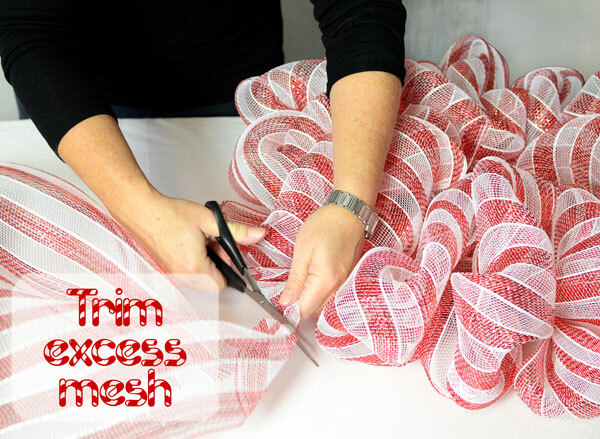 This festive Christmas wreath was created with the Candy Cane striped deco mesh, the 12" wreath form and a pair of scissors. These minimal supplies are really all you need to craft a creative wreath on your own. 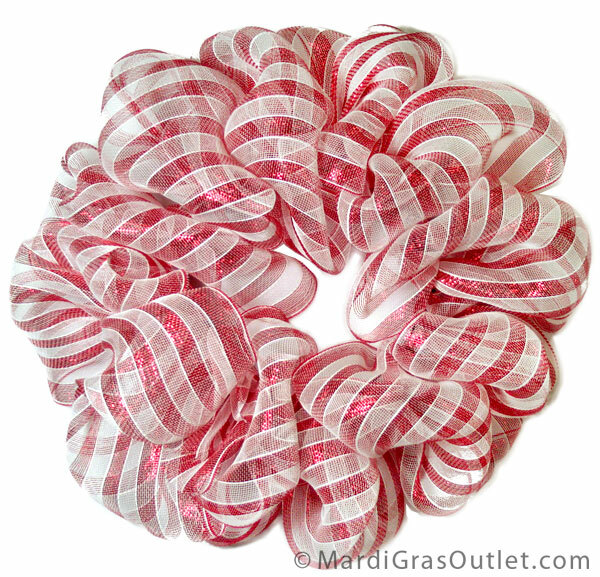 The finished candy cane stripe wreath is over 24" wide. 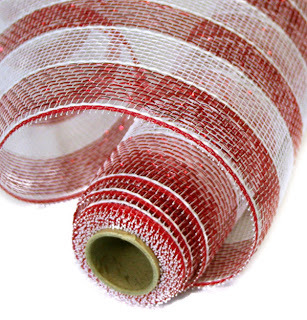 Both the deco mesh and wreath form are weather proof and durable so they are perfect for outdoor use for the holidays. Click these links to see the whole selection of deco mesh and wire wreath forms for all your options for a custom holiday wreath. 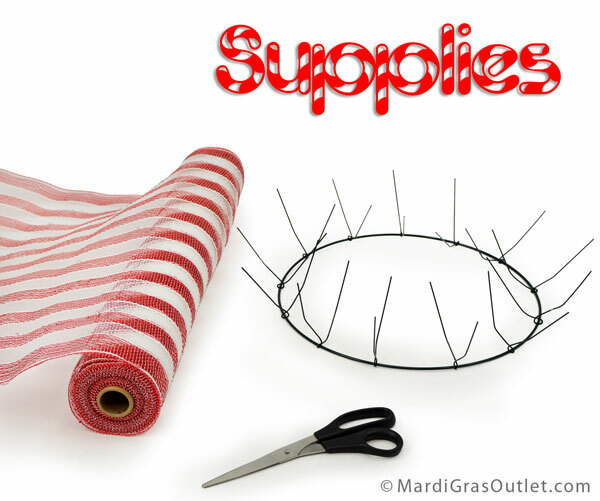 To purchase these products from www.mardigrasoutlet.com, click on the individual product link below or click HERE. The 24" wreath takes approximately 6 yards of Deco Mesh. The total cost of the supplies is under $12. 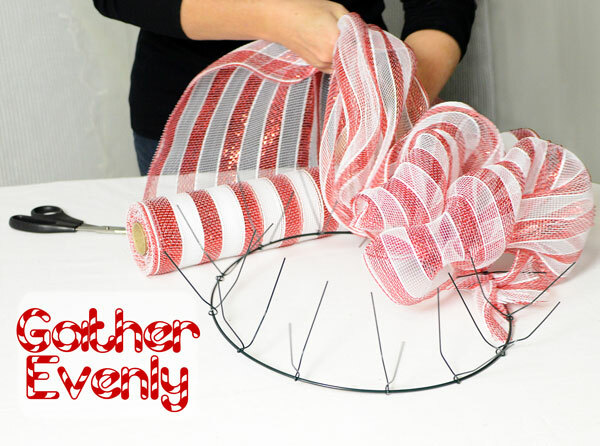 This candy cane striped Christmas wreath takes about 10 minutes to make. Gather the end of the deco mesh together. Insert this end between two of the wire clamps. Twist the wire around the mesh, clasping it in place. Move down the deco mesh about 8-10 inches and gather a section of mesh together again. Place this bunch of poly mesh in the next wire tie. Twist the ties around the mesh to secure in place. 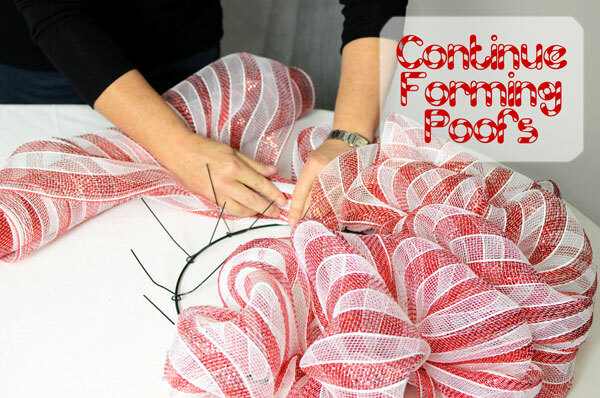 Wreath Tip: Try to keep the loops of deco mesh uniform length so the wreath will be symmetrical. 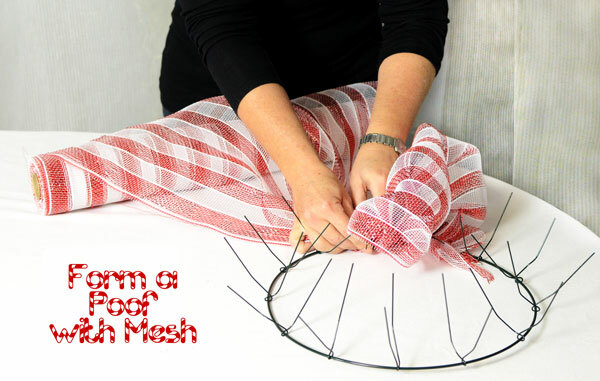 Gather with both hands from each side of the mesh to make even loops. 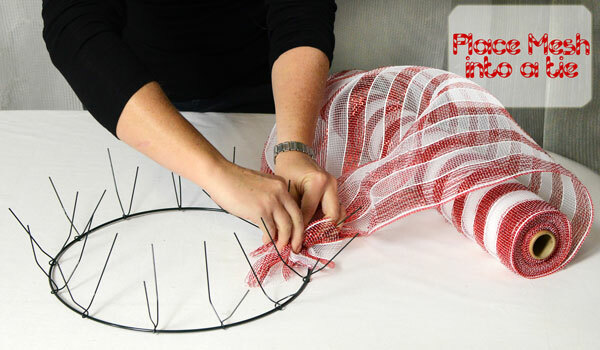 Continue around the wreath form, adding deco mesh in bunched sections into the wire ties around the form. When you get back to the original tie, finish off the wreath by twisting the last loop of deco mesh into this original tie, as shown. With the wreath complete, there is still deco mesh left on the roll for an additional project! Add in a accent ribbon to create a different look. 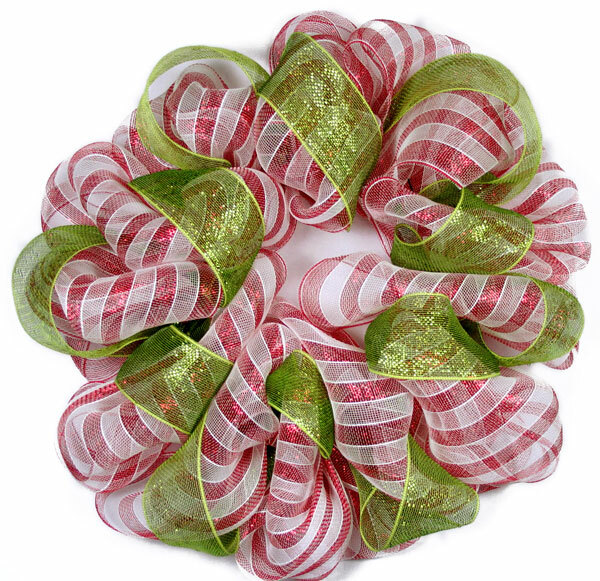 Lime green ribbon adds a modern twist to the traditional color scheme of red and white candy cane stripes. We added in 4" wide deco mesh ribbon in metallic moss/lime. With the EZ wreath form, adding in more layers is just as easy as the first layer. 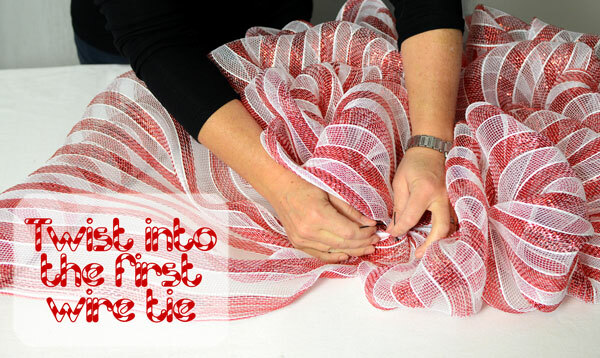 At a starting point on the wreath, add a bunched piece of 4" deco mesh ribbon in by securing into a original wire ties. Twist to keep the ribbon in place. This candy cane wreath was given an upgraded look. Check out our newest version, HERE.